Diamond Dogs is a 5 reel by 25 pay-line slot that has a lot to offer animal lovers of all backgrounds. Even if you aren’t a dog person then you will still find something worthwhile here. These are some rather high-end dogs, all having different personalities that are wrapped in the life of luxury. Theme wise, this slot is very good at creating a sense of interest, with the pet theme being its main drawing power. Bonus features in this slot add to what you see at face value, providing players with more incentive to continue running the reels. Wilds, scatters and free spins are just an example of alternative ways to play. Diamond Dogs can be played via a variety of different devices, including Windows, Linux, or Mac systems respectively. Short for Net Entertainment: NetEnt, known not only for their highly anticipated online slots and games, but also for their pioneering attitude towards the industry itself. They lead by example with cutting edge titles such as Butterfly Staxx and Gonzo’s Quest. The sky is always the limit for these game devs, offering cutting edge innovation with themes we all know so well. The first thing you’ll notice here are the impressive graphics and animations. Everyone of the decisions made from developers NetEnt are all purposeful in adding to the theme of high end dog living.The lavish purple background plays incredibly well within the gold tinted symbols that you see cascading across the reels.The music heard in the background of this slot also plays along with the chosen theme, music that is eerily reminiscent of what you’d find in most clubs when one might want to dance. Dog barks will accompany winning combinations on the reels which again, adds to the immersion. Each symbol in this slot is representative of a different numerical value depending on how many symbols are involved within that winning pay-line. It goes without saying, but the more extravagant the symbol, the higher it probably pays out. The highestvalue symbol at play here happens to be the dog house that is situated by the beach. There are lower-value symbols here that all possess different ways of quick wins, these take the shape of your classic J, Q, K and A symbols. Wilds and scatter symbols can be found in this slot which, as we’ve mentioned previously, are instrumental in hitting those high scores. Dog lovers rejoice, there is finally an online slot that captures the glitz and glamour of high end pooch living with all of the trimmings. Pet lovers will no doubt get a kick out of the cartoonish graphics that do a great job in making the animals seem anthropomorphic in nature. If you are looking for more of a true to life feel then maybe this slot isn’t for you, but in saying that, the gameplay and overall presentation, is worth playing for that alone. 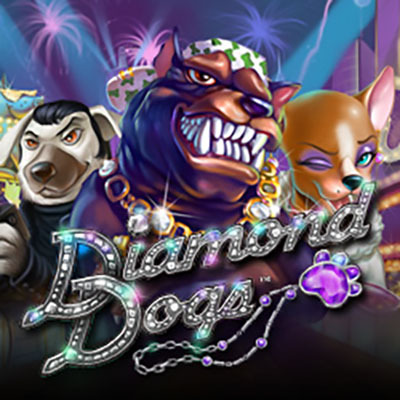 Diamond Dogs: your new favourite slot. Play now.